Emergency laparotomy is a high-risk procedure, and incisional hernia is a common complication. This study aimed to investigate whether a standardized fascial closure technique, using slowly absorbable monofilament suture in a ratio of at least 1:4, could reduce the long-term occurrence of incisional hernia after emergency laparotomy. The single-center study was conducted as a questionnaire study including all patients who had an emergency laparotomy at Copenhagen University Hospital Herlev from May 2009 to May 2013 and June 2014 to November 2015. The historic cohort was used as a control. In the historic cohort of 2009–2013, different fascial closing techniques were used according to the preference of the individual surgeon. On June 1, 2014, we introduced a standardized method of fascial closure. A total of 465 patients met our inclusion criteria. The response rate was 77%. In all, 104 patients developed an incisional hernia: 77(27.0%) in the historic group and 27(15.0%) in the 2014–2015 group (p = 0.02). At long-term follow-up, 104 patients had undergone elective incisional herniotomy or had an incisional hernia confirmed by a medical doctor. The rate of incisional hernia was reduced from 27.0 to 15.0% (p = 0.02) comparing years 2009–2013 with 2014–2015. 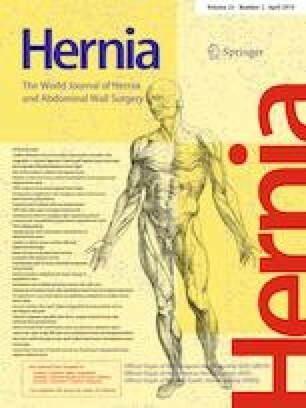 This study suggests that development of incisional hernia may be reduced significantly if a standardized technique is applied using slowly absorbable monofilament suture in a ratio of at least 1:4 in emergency laparotomies. Tine Thorup and Mai-Britt Tolstrup contributed equally to this manuscript. TT has nothing to declare. MT has nothing to declare. IG has nothing to declare. Approval of data collection was obtained from the Danish Data Protection Agency HGH-2016-030 I-suite: 04477, and the Danish National Committee on Health Research Ethics was contacted but had no approval requirements because the new technique was used on all patients with consecutive inclusion and did not depend on randomization or study protocol. This article does not contain any studies directly involving human participants, as it is a questionnaire study with data already collected. Informed consent was obtained with all questionnaires collected.